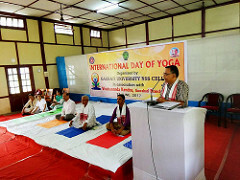 Along with rest of the country, the 3rd International Yoga day is celebrated in Guwahati on 21st June by Vivekananda Kendra Branch Guwahati with more than hundred devoted, enthusiastic Karyakartas. Kendra conducted the programme in 45 places of Guwahati and reach out to approximately 2200 people. The places are the Kendrastans, prime educational institutes, research institutes, Govt offices, corporate hubs, hospitals, some NGOs etc. The event was planned for the last one month by the Yoga core team, VK Guwahati and VKIC. The training to the Karyakarta teams was given in the Saturday and Sundays of the whole month. All the Yoga sessions are followed by a Kendra parichaya session. A good number of Kendra publications are also sold in the venues. The follow up activity will be Yoga Satra. Some of the venues are IIT Guwahati, Gauhati University, Cotton University, TATA Institute of Social Science, Beltola College, Arya Vidyapith College, RGB College, Assam Institute of Management, NERIM, IGNOU, IIIT Guwahati, Regional Science Centre, IAAST, Archeological Survey of India, Bamunimaidan Industrial Estate, Assam Police Battalion, NRL, Railways Bamunimaidan, Reserve Bank of India, Postal Department Meghdoot Bhavan, Central Excise, BSNL, Hyaat Hospital, etc.